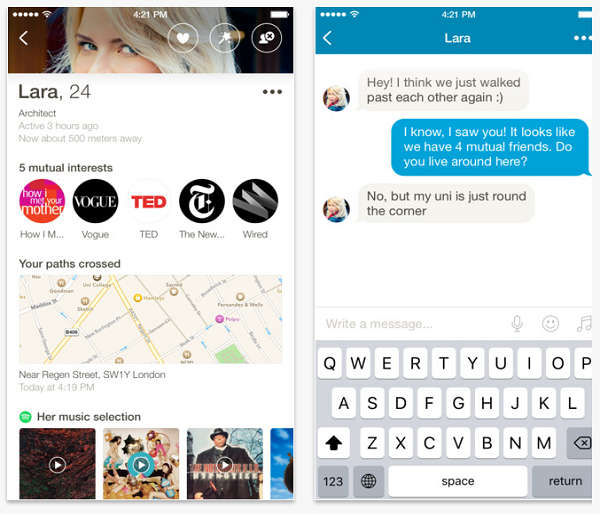 The Happn App changes the way free online dating sites work. 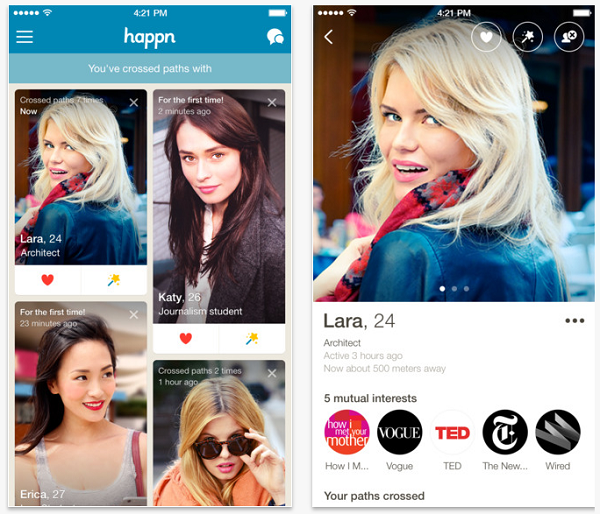 happn.com have developed a dating app which operates fast on Android, iPhone, and Windows Phone and comes to help singles who are interested in dating find people they’ve crossed paths with. Our review of the Happn App determines that if you are looking to enter into a relationship, find love, a romance, or even to hook up online, we highly recommend you to download the Happn dating app to your mobile or tablet. 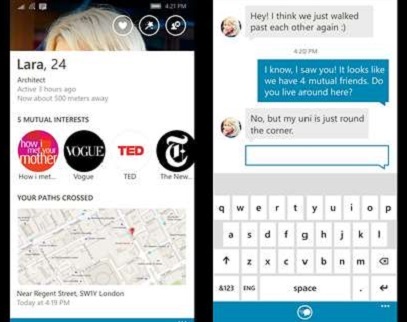 checking the multitude of dating features which the Happn App offers, including its great design and intuitive navigation, it’s clear to us that it is a needed addition to any mobile phone or tablet whether its Android, iPhone, or Windows Phone. The singles dating app caters to a local crowd, making it easy to find other app users who are near by and who are looking to meet, enter into a relationship, or date in your area. The advantage of the Happn app is that it connects singles who own an iPhone, Android, or Windows Phone with one another based on the places they go to. This means that any mobile user who passes you by on the street and uses the app can be a potential dating match. It’s important for us to let you know that there are many other Android dating apps and iPhone dating apps which we have reviewed, and which you can download right here (in case this app isn’t what you were looking for). 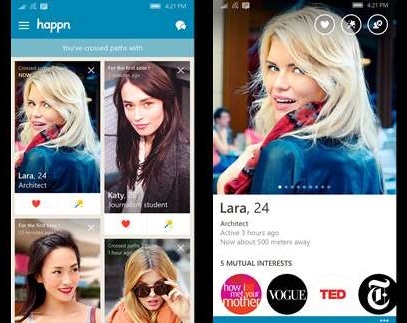 For owners of an iPhone, Android, or Windows Phone the Happn App is a must download and install. This dating app is perfect for those singles who are are using their mobile to date online. 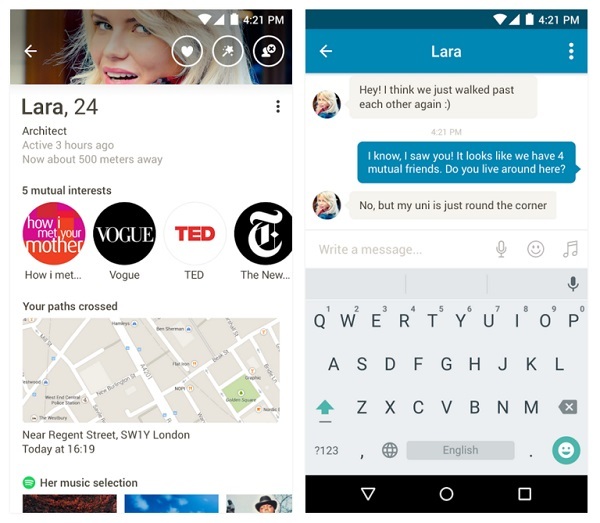 The Happn mobile app is free to use, download and install, it serves a large social dating community and is safe, stable, and fun. We recommend this singles dating app for anyone who’s social and is into finding love, a relationship, or just dating online. 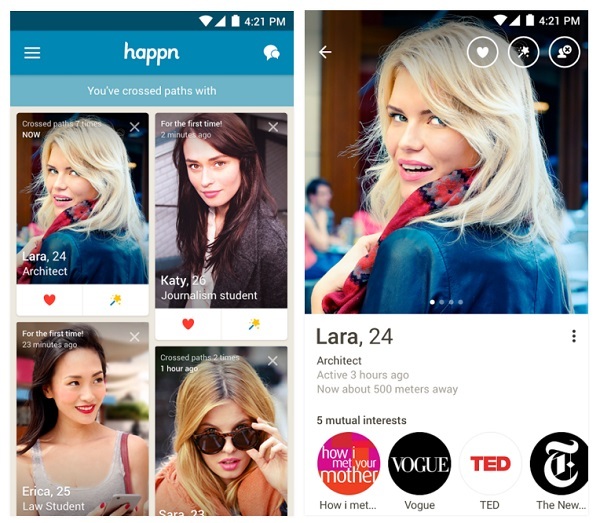 Our advise is download the Happn App to your Android, iPhone or Windows Phone, you’d be glad you did. How can I talk to someone on Happn? To start connecting via Happn you need to send a person a like or a charm and they need to like or charm you back. Only mutual likes and charms can open up a chat session in Happn. Do I need to keep the app open at all times in order to see who’s crossing paths with me? No, the app doesn’t need to be open in order to register people who pass you by on the street. 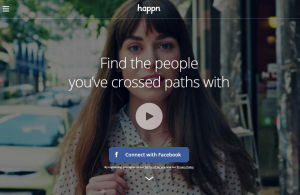 Must I use Facebook to create an account on Happn? Yes. The Happn app only works with Facebook Connect in order to prevent fraud.